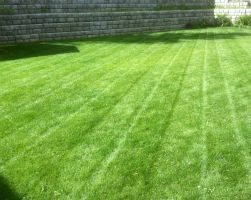 Mike's Mowing provides professional lawn and landscape services in Kamloops BC. We are a fully insured company dedicated to providing reliable service at a competitive price. Our services include lawn care, hedge trimming, pruning and general landscape maintenance. Contact us for a free estimate. Tired of not knowing whether your lawn service provider will show up? You won't have to worry with Mike's Mowing. Sign up for our weekly lawn mowing service and you can be sure that you will receive a quality mow at a consistent time every week. In addition to lawn mowing we also provide lawn maintenance services to keep your lawn green and healthy. We can aerate your lawn to reduce soil compaction, dethatch (power rake) your lawn to remove excess thatch & debris, and also fertilize your lawn with quality fertilzer to make sure your lawn has the nutrients it needs. February 2019: Spring is just around the corner (hopefully!) contact us now for of 2019 mowing services. We have limited openings. Is your cedar hedge getting a little out of hand? No problem, we can trim your hedge to keep it healthy, manageable and looking great. We can also shape any shrubs, or small to trees to give them a nice manicured, or natural look. In addition to hedges we also prune fruit trees to keep them healthy, productive and well shaped. Need some help with your yard work? Give us a call. We can provide full fall cleanups, spring cleanups, garden maintenance, weeding and debris removal. We'll clean up any debris, perform any required pruning, mow the lawn and haul everything away to the compost. In addition to our residential services we also provide many services for commercial customers such as weekly lawn mowing, weeding, litter pickup and pruning. Please contact us for more information. Mike's Mowing services all areas of Kamloops including Westsyde, Raleigh, Juniper, Batchelor Heights, Valleyview, Dallas, Barnhartvale, Sun Rivers, Downtown, North Shore, Brock, Sahali, Dufferin and Aberdeen.